I dropped a fair bit a money on my iPhone 6 Plus and have loved this device ever since. The larger “phablet” sized screen did take some getting used to but in relatively no time at all, I was having no issues and wondering how I existed with a 4 inch screen! With my investment comes a certain anxiety if something happening to it from a fall. So naturally I keep it in a case and invest in a good screen protector. I have used a lot of different screen protectors over the years and just recently got a 5 inch Android “phablet” which came with a screen protector free of charge. So the basis of this review is going to be comparing the Amzer Kristal Edge2Edge screen protector between the Invisible Shield Glass screen protector that I am currently using and that of a low end free version that came with the Android device I have. 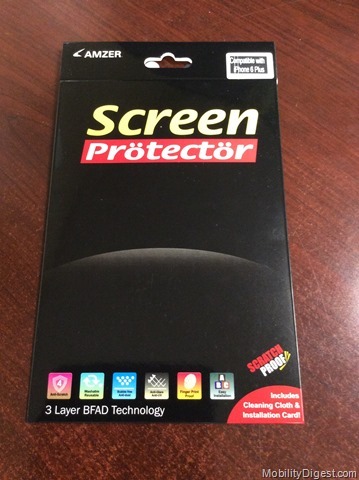 Edge2Edge, an Amzer® exclusive, Heavy duty screen protector! Product Type: Kristal™ Edge2Edge Screen Protector. Compatible Model: iPhone 6 Plus. 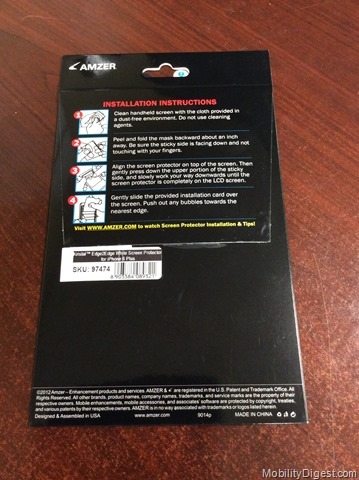 Amzer provides the instructions for the Amzer Edge2Edge screen protector conveniently on the back of the package so that they can reduce cost of having to print them and include it in the package and probably the main reason is for everyone to be able to se the instructions before attempting to install the screen protector first. the only problem I had was is the package is hard to open and most likely consumers are going to destroy the packaging opening it up. A perforated pull off tab would be better here and provide security for the consumer and ease of opening allowing them to go back and re-read the instructions if necessary. The usual stuff is provided. First the squeegee for getting out the air bubbles and then the cleaning cloth. On the cleaning cloth. This thing rocked! Actually I have never had a better cleaning cloth and that includes the really nice ones I got over the years included with OtterBox Defender cases. I really thought this one did a great job. So I’m keeping it in my briefcase for future finger print clean up. Yes, future finger print cleanup. More on that in a minute. Yikes! They sent me the wrong color screen protector! Crap, mine is black screen so how is this going to work? Well, not other way to find out right? 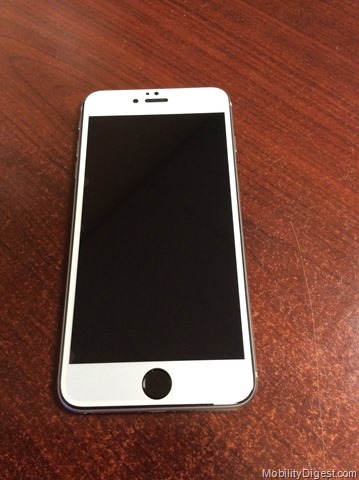 There is nothing new and exciting about installing the Amzer Kristal Edge2Edge Screen Protector. It has two pull off tabs which are labeled according to what side it goes on as you can see in the picture above. Pretty easy to understand even if you did destroy the package. Remove the front side film and install on device. I an assure you that my screen was 100% clean of even the smallest detectable piece of dust, but upon installation I noticed that something was under the screen protector. Not sure where the debris came from but it I had to pull off the screen protector and remove with the corner of the squeegee. It was not hard to line up. The screen on the iPhone 6 Plus is huge so there is a lot of visual angles to line it up with. Pulled off the outer protective film and was surprised that it did not have the bubbles in it that other screen protectors have. The squeegee got all of the visible bubbles out without much problem. The Amzer Kristal Edge2Edge Screen Protector costs $19.99 from the Amzer website or on Amazon. This places it between the high cost Invisible Shield Glass screen protector at $40.00 and the cheap $10.00 screen protectors. The Amzer Kristal Edge2Edge Screen Protector has a very good feel to it but is not as responsive as the Invisible Shield. Having said that it was much better than the Android included screen protector. My only real complaint about the Amzer Kristal Edge2Edge Screen Protector is that it is a finger print magnet. It seems to have more of a matte finish and it really does a nice job showing off my finger prints. Otherwise it is very responsive and I thought it did a way better job at showing the amazing iPhone 6 Plus screen resolution. I wanted several videos with it and had no issues at all. I even played my recent game addiction Clash of Clans and felt it was good for gaming as well. 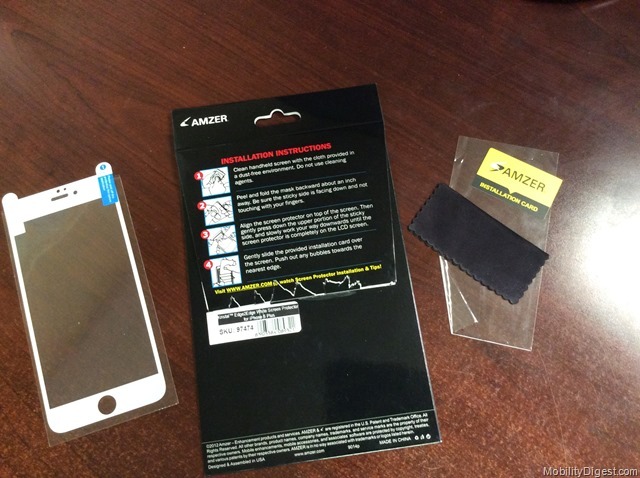 At $20 bucks the Amzer Kristal Edge2Edge Screen Protector is worthy of your consideration. It’s a good value for the money. It is not as nice as the Invisible Shield Glass, but way better than the lower end screen protectors.